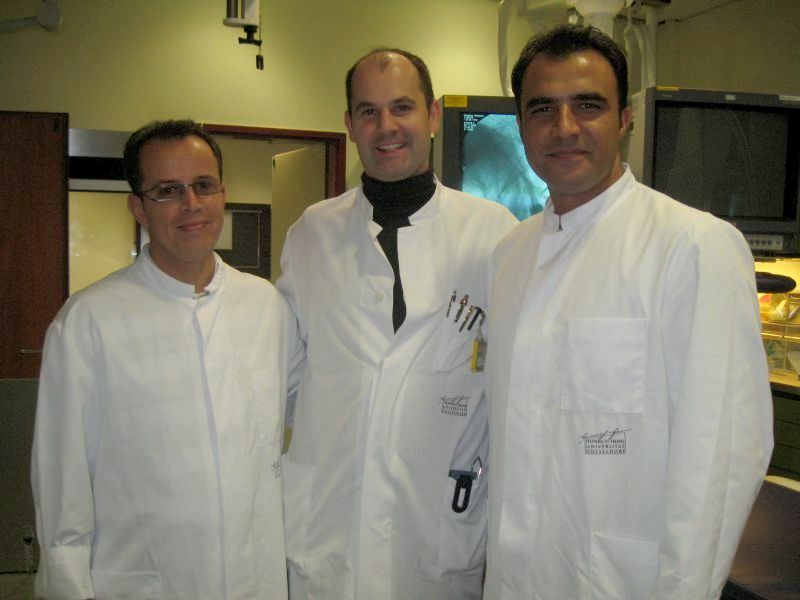 Study visits to Europe for doctors. Dr. Munib und Dr. Sahab were able to put endoscopy techniques into practice on phantoms and to take part in a stent workshop at the Institute for Medical Research and Experiment Surgery Tübingen led by Prof. Grund. 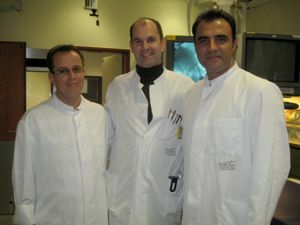 In Düsseldorf they each also had the opportunity for a further week to observe best practice in the Endoscopy Department of the Clinic for Gastroenterology, Hepatology and Infectiology at the University of Düsseldorf, as well as in the Endoscopy Department at a local Düsseldorf Hospital. 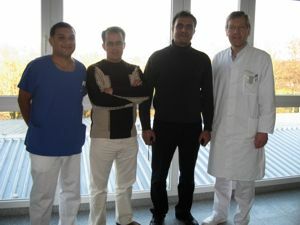 A short time later Dr Oqabi und Dr. Miakhil were also able to observe the work of both institutions, and were invited for a further week to observe the work at the Clinic in Leverkusen. 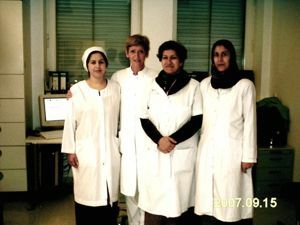 The personal contact with the doctors over a longer period of time gave us the chance to find out in more depth about the working conditions in different areas of Afghanistan and to discuss the kind of support that it would be both appropriate and necessary for us to provide. Our thanks go to the doctors and to the endoscopy teams, who went out of their way to give practical help and support to their Afghani visitors. Thanks are also due to the DGE-BV, the DGVS and to the Georg Strohmeyer Foundation for the generous financial support they provided to make the study visits possible. 2007:Study visit to Germany of three female doctors from Kabul. 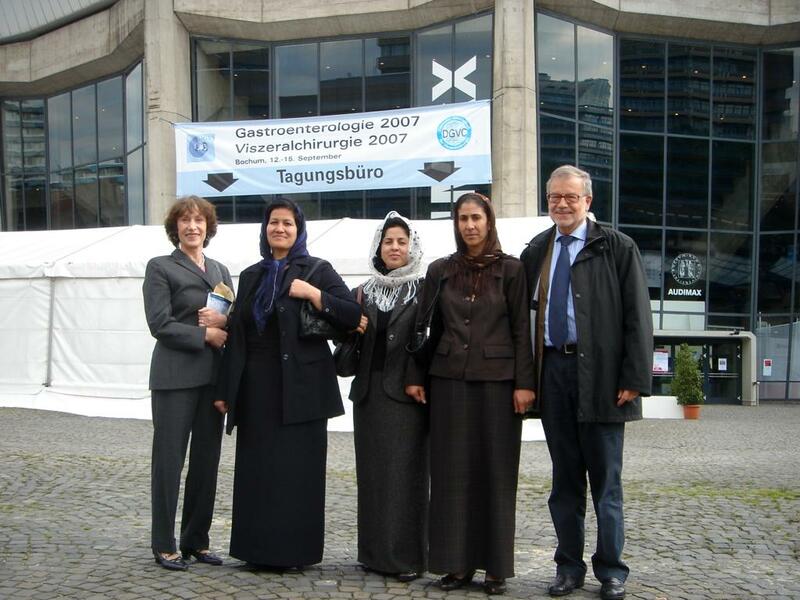 Dr. Maroofa Haiel, Dr. Najla Nasir und Dr. Samea Hasham as guests at the annual conference of the DGVS. 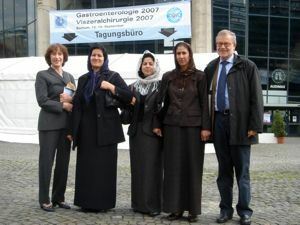 The president of this year's conference of the DVGS, Prof. Schmiegel, invited three female doctors from Kabul to take part in the annual conference of the DGVS in Bochum, Germany. At the conference the Foundation used a poster to draw attention to its activities. 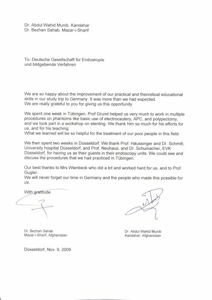 Prof. Schmiegel recommended that the DGVS support the work of the Foundation. Prof. Gugler kindly acted as a guide to the female doctors through the bewildering variety of presentations and offers available at the conference. Prof. Gugler kindly acted as a guide to the female doctors through the bewildering variety of presentations and offers available at the conference. 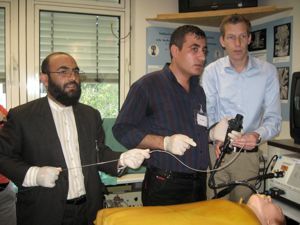 In the same way as last year, two Düsseldorf hospitals offered the visitors the opportunity to observe the work of their endoscopy departments. The "Medizinische Klinik des Evangelischen Krankenhauses (Prof. Neuhaus/Dr. Schumacher)"
The "Klinik für Gastroenterologie, Hepatologie und Infektiologie der Universität Düsseldorf (Prof. Häussinger/Dr. Schmitt)"
In addition the visitors were given the chance to observe the work done in Dr. Ahmadiar's practice, located at Engelskirchen, near Cologne. Our thanks go to the teams who gave such a warm welcome to our visitors and looked after them during their stay. 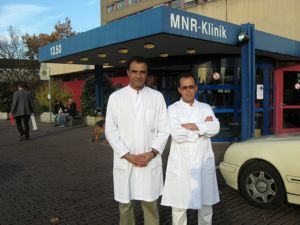 September 2006 -Visit of two Afghan doctors to the Netherlands and to Germany. 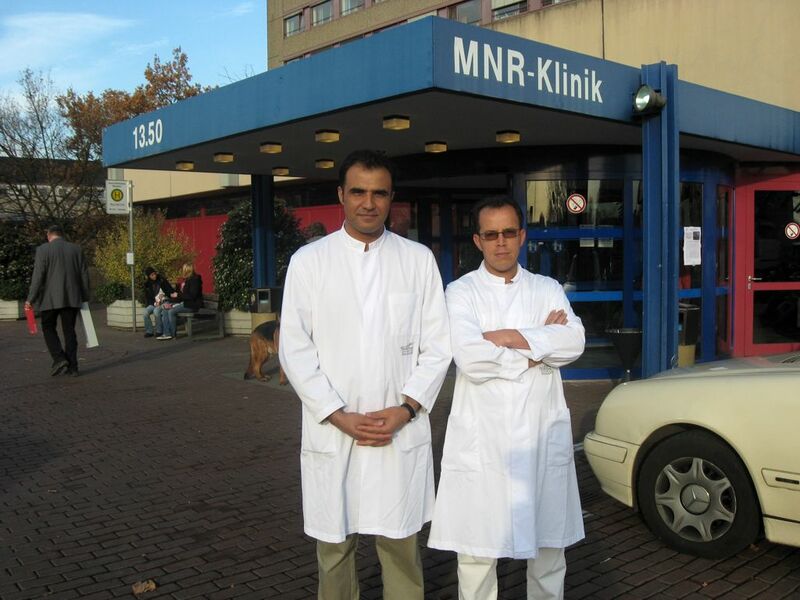 In September 2006, Dr. Sediqi (Kabul) and Dr. Noori (Mazar-i-Sharif) were invited to take part in a two week Advanced Post-Graduate Course in Gastroenterology in Zwolle and in Amsterdam. (Prof. Nelis, Prof. Mulder). 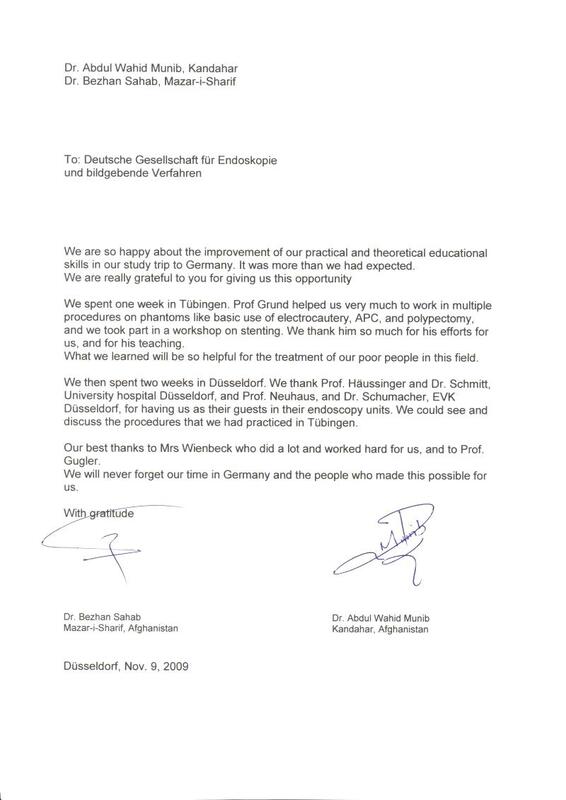 For one more week Dr. Sediqi was offered to visit the endoscopy centre of the University Hospital in Jena (Dr. Hocke / Prof. Stallmach) before he went on to the UEGW (United European Gastroenterology Week) in Berlin. We wish to thank the hosting doctors for their great commitment, interest, and help..
"It was really a great pleasure for me to be there. And this is to thank learned Prof. Classen, Prof. Gugler, and Olympus Co. for their support. ... My achievements: I learned new topics. I made friendship. I got promises and support for the Wienbeck endoscopy center. ...."